The year is 2032, sixteen years after a deadly virus—and the vaccine intended to protect against it—wiped out most of the earth’s population. The night before eighteen-year-old Eve’s graduation from her all-girls school she d iscovers what really happens to new graduates, and the horrifying fate that awaits her. I find the story unique but I think it needs more elements in it. Eve is a very lovely read for me, I find the story unique but it lacks certain elements that would make it a big hit for me. There’s a vaccine for the plague but she thought she was getting it and will live a happy life after her graduation but she had it all wrong. Eve ran away from school after discovering the secrets of what happens to the graduates. The graduate is submitted to the lab and becomes breeding paraphernalia for the country to survive. Eve was brought up with only girls on her school that’s why the moment she met Caleb she doesn’t know whether to trust him or not. All the things that were taught to them on school were a big lie and she must trust Caleb in order to survive. A riveting read but it left me disappointed in a good way. I don’t know if I’ll be happy throughout the whole read but as I said it needs more elements. I was not happy with the fact that the story was all over the place. I don’t know what to expect, I kept reading but got disappointed just for the fact that some details are not well covered. Best example would be that Eve easily trusted Caleb for some reason she was born to hate the alpha I didn’t find any resistance from her point. The whole story revolves about trusting, making decisions and love which I think is very much cliché for a dystopian book. Eve as a character has never won me, I find her personality very strong yes but I can’t find the reason to get used to her personality. She obviously has trust issues which I totally understand but having them in a very short period of time makes me want to think that she was just putting the game face on. I also find her character very intelligent, well she was a valedictorian of her school right. But her intelligence lack from what the whole point of surviving is, she may have the intelligence but she lacks the skills. I think instinct is what women’s edge over males but I don’t think she has this one skill. Arden and Caleb play a big part of the story, Arden is the only person Eve trust. Apparently Arden knows everything that was happening to the graduates thus leads to her escaping the school. Caleb is obviously the love interest of Eve, his character is what you expect of a normal boy would be. I like how Caleb and Eve’s relationship progresses in the story, the constant love hate and save your life and I’m in love with you situation. 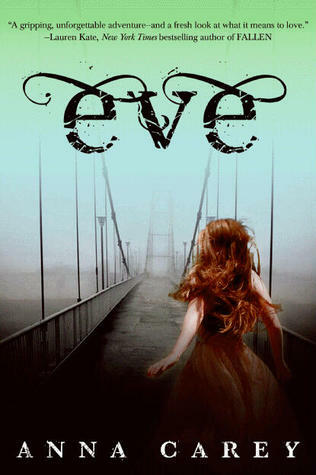 I like the cover of Eve; I like how it shows the bridge on her way to Califia which is her destination all throughout the book. The title is really good specially the font is very unique. I’m just not sure if it was the dress that Eve on her way to Califia. The cover girl reminds me of The Vespertine. The book was also quoted by Lauren Kate and I think it’s such a giveaway on how to expect this book. Overall this book was a whole fun to read if you’re looking for something to take your time off. I can recommend this for people who has not yet read dystopian books. Too many holes from the whole read that I can’t just understand. There is a fine line of understanding the whole concept of the King and Eve but it was not discussed much. I wish there were characters who would explain more of what really is happening, the plague was not really mention very well and the ending was a cliffhanger that could frustrate you. It left me nothing but a question mark; I just can’t follow the whole scenario. I think I would give the next book a try but if it doesn’t pick up well then I might as well end the series here. Anna Carey has been a gift wrapper, face painter, nanny, horrific cocktail waitress, sofa saleswoman and children’s book editor. She graduated from New York University and has an MFA in fiction from Brooklyn College. She currently lives in Los Angeles, where she’s at work on the second book in the Eve trilogy. This entry was posted in 3 Star, Anna Carey, Dystopian, Eve, Guest, Review. Bookmark the permalink. I've heard of this one, but never actually checked it out. Dystopian novels take me a while to get into, but once I do, I usually like them. Thanks for sharing.